Holiday Branding Archives | Rozdeba Brand & Co. This holiday season, successful brands continued the tradition of wrapping themselves in a feel-good message, hoping consumers will be pleased with their “presence” (sorry, I couldn’t resist). As they should, considering the US retail industry generated over three trillion dollars during the holidays. This number is from 2013 and I am sure it’s even higher today. This equates to about 20% of total annual sales – and for some brands the number is much higher. That’s a lot of money (even if one-third is on credit cards). But how does a brand ensure it gets its fair share? The holiday season is the perfect time to tap into the human emotions of peace, love, kindness and hope. It’s beautiful, yet frightening. Consumers are vulnerable and have credit! And ironically, during this time of harmony, brands are busy fighting each other for attention and won’t stop until the last dollar drops. That might be the reality of retail, but good brands understand the true meaning—it is better to give than to receive. The best way to capture the holiday spirit is through a highly emotional TV commercial or online video (a topic of a previous article “Why Great Brands Still Needs a Great Commercial”). In 2015, there were over 100 holiday TV ads airing on US TV, but so far this year, there have only been 47 holiday ads reported by research firm Ace Metrix. Holiday advertising seems to be big in Britain and Germany where brands produce run-away winners. It’s all about giving sincerely and inspiring the feeling of the holiday season. For many families, traditions, like watching the Griswolds light up their house (Christmas Vacation), or witnessing Bill Murray get a second chance to get it right (Scrooged), take us to fonder times and helps to recharge the soul. So while we’re all killing ourselves giving, the reality is that we need to receive appreciation. It’s here where brands have a responsibility to help consumers by framing the holiday season and help us have an enjoyable Christmas (for a price). And when they strike a chord, I can hear those cash registers jingling all the way! 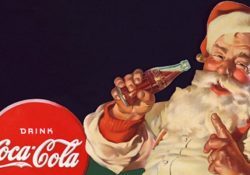 The very best brands who have seamlessly carved a place in our minds during the holiday seasons and continue to reap the rewards are such brands as: Coca-Cola, Macy’s, John Lewis, Marks & Spencer, Walmart, and WestJet, to name a few. But each year a new brand finds its holiday moment to shine and is rewarded by millions of views and likes from around the world. My favourite for 2016 is from Allegro, an auction site based in Poland. This commercial has all the ingredients for a wonderful holiday video including a dog. John Lewis, a UK-based department store, continues to hit the ball out of the park with their iconic holiday adverts. It too has a dog and other loveable animals. The top Canadian brand for me was WestJet. They continued to surprise and delight their customers, and focused this year on the people still recovering from the devastating fire in Fort McMurray, Alberta. A nice slice of Canadian values–giving. If none of these have ignited the spirit of Christmas within your soul then I would suggest that you seriously consider becoming a member of the Ebenezer Scrooge Fan Club. Otherwise, I wish you all a wonderful holiday, sharing gifts and enjoy time with family and friends. Have a Merry Brand Holiday! Please feel free to share your favourite advert for the 2016 holiday season and explain why.